Equity markets tumbled in the final weeks of 2018 as investors fretted over slowing global trade, rising interest rates and the U.S./China trade war. But in January, the U.S. Federal Reserve switched from a hawkish to a dovish stance on interest rates, while the rhetoric around trade improved. It was enough to trigger a wave of investor optimism with the S&P 500 up 13.6% in the first quarter – its best start to a year since 1998. The U.S. economy continues to perform well, with the S&P 500 recovering all of last year’s losses. However, after the strong start in Q1 we expect limited upside from here with increased volatility in the months ahead. For now, with the exception of the U.S. and emerging markets where we are slightly overweight, we are neutral on equities in general. With uncertainties in the economy, including a slowdown in global growth that still have to play out, we adopted a number of defensive strategies in Q1. This included initiating defensive hedges on the S&P 500. As well, we reduced exposure to global high yield bonds, which could deteriorate if the market corrects, and increased our weighting in Canadian investment grade bonds. Markets worldwide were also mostly higher, with the MSCI World Index up 12.33% in Q1. Like the U.S. market, international markets were buoyed by more accommodative central banks, and hopes for a truce in the U.S./China trade dispute. At home, the economy slumped in late 2018 and the Bank of Canada has signaled that it may be less aggressive on interest rate increases. Even with the economy appearing to slow, the S&P/TSX Composite Index was up 15.44% in Q1 (Chart 1). It was led higher by strength in health care equities and rising oil prices late in the quarter. The MSCI EAFE Index was up 10.05% at the end of Q1. This gain came even though growth in Europe is expected to slow to 1% over the next 12 months. And Britain’s destabilizing struggle to leave the European Union continues to undermine investment in the eurozone. Despite China facing sluggish domestic demand and bruising tariffs, emerging markets were still up with MSCI Emerging Markets Index climbing 9.90%. Emerging market equities rose on optimism surrounding the U.S./China trade talks, and the possibility that the Fed will remain on the sidelines, reducing upward pressure on the greenback. The market selloff at the end of 2008 and weaker global growth may have influenced the Fed’s decision to take a more dovish stance on interest rates. Certainly, most of the fuel behind the equity rally in Q1 stemmed from the possibility that the Fed may not be raising rates for a considerable length of time. Moreover, the bond market appears to be pricing in an interest rate cut, with U.S. 10-year Treasury yields dropping to 2.4% at quarter end. Even without a rate cut, at its last meeting on March 29 the Fed dot plot projection suggested that its benchmark rate will remain near 2.4% at least to the end 2019. And it slashed its forecast from two hikes this year to zero. Although less clear, the Bank of Canada also appears to have changed its outlook for interest rates. In late 2018, the bank indicated that there was room for rates to run higher. The economy appears to have slowed since then, and BoC Governor Stephen Poloz recently stated that he now sees “increased uncertainty” on the timing of future increases. However, it’s our view that the Canadian economy will deteriorate in the coming months, and the BoC won’t be raising rates in the near term. Canadian bond yields, perhaps pricing in a slowing economy and a less aggressive BoC, moved lower in Q1. The yield on Canadian 10-year bonds started the quarter at 1.9% and ended at 1.6%. The yields on U.S. 10-year Treasuries also moved lower on the Fed’s outlook, ending the quarter at 2.4%, down 26 bps. However, until we get more clarity on the global economy, we expect that yields will move higher, but at a very slow pace. Canada’s economy grew by just 0.1% in the fourth quarter of 2018, the worst quarterly performance in two and a half years. While employment surged in January, as noted, we believe the Canadian economy is slowing. Consumers carrying record personal debt loads have started to reduce spending, with the five interest rate increases we’ve seen since July 2017 raising the cost of borrowing. 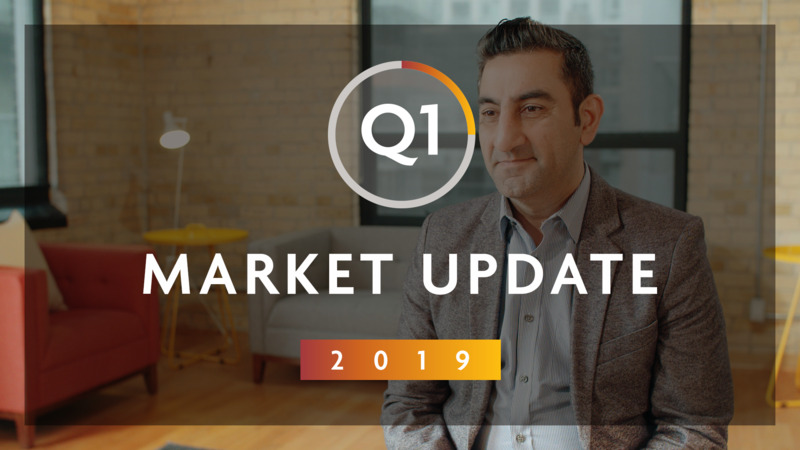 As well, those higher rates appear to have backed into the housing market, with prices softening in a number of key Canadian markets. That said, there are positives including a surge in oil prices late in Q1 with West Texas Intermediate trading at US$60 a barrel on March 29. Rising oil prices and the dramatic narrowing of the price differential between U.S. and Western Canadian Select oil, which was trading at US$50 a barrel, should help the Canadian energy sector (Chart 2). With the recent cuts in production announced by Saudi Arabia and Russia, and ongoing political instability in Venezuela, we believe oil may be able to hold near these levels over the near term. However, until we have greater clarity on the direction of the Canadian economy, we will continue to be underweight Canadian equities. The U.S. economy grew at its weakest pace in three years in Q1, with consumer spending (a main driver of the U.S. economy) barely increasing. However, interest rates remain low, job creation is still strong and consumer confidence is rebounding. This suggests the drop we saw was likely a temporary reaction to last year’s stock market slump and political chaos in Washington with the government shutdown. Indeed, job creation posted a solid rebound in March, with non-farm payrolls expanding by an above-consensus 196,000, with the unemployment rate holding steady at 3.8%. American companies are coming off of a strong 2018, with corporate profits growing by 7.8%, the biggest increase in six years. However, we believe U.S. corporate profit growth will be lower in Q1, but by how much remains to be seen. And given that American companies derive nearly 25% of their profits from outside of the U.S., a resolution to the U.S/China trade dispute would no doubt be a welcome shot in the arm. That said, even if a truce is reached with China, Washington’s protectionist tendencies might continue. Moreover, now that U.S. President Donald Trump has been cleared of any Russian collusion by the Muller investigation, he may feel less constrained. And there is no guarantee that the White House won’t be emboldened and possibly shift to a more aggressive trade policy with Europe. However, we believe the U.S. economy is still the world’s strongest, and we continue to be slightly overweight U.S. equities. Economic growth in the European Union slowed in the first quarter, and could fall to 1% in 2019 from 1.8% in 2018. The slowdown is the result of a drop off in international trade and foreign investment, as well as weak European financial markets. The continent’s sagging economic fortunes have also been aggravated as investment slowed in wake of the ongoing political uncertainty surrounding Britain’s efforts to escape the EU. As well, Italy’s economy continues to shrink, raising the specter of a financial contagion with banks across the EU holding nearly US$476 billion in sovereign and private Italian debt. Political and economic uncertainty in Europe, coupled with a slowdown in global trade could erode economic growth in the EU even further. Hence, we are underweight European stocks and neutral on EAFE equities overall. China’s economy, in part weighed down by the tariff battle with the U.S. continued to slow in the first quarter. However, China is taking steps to stimulate its economy. Spending on infrastructure has picked up and China’s central bank has lowered reserve requirements to stimulate lending by commercial banks. The government hopes to see GDP growth stabilize in the 6.0 to 6.5% range this year. There are signs that the Chinese economy is stabilizing with the country’s Manufacturing Purchasing Managers’ Index rebounding to 50, indicating a return to expansion. Equity markets have also started to recover with the Mainland China CSI300 Index up 28.7% in the quarter. For our part, we are positive on the long-term growth prospects of many emerging market countries, given their stronger demographics and fiscal position. As well, with the Fed on hold, it may slow the upward trend in interest rates and the value of the U.S. dollar. As a result, we are overweight emerging markets. With the exception of the U.S and emerging markets where we are slightly overweight, we are largely neutral on equities as well as bonds. U.S. economic growth appears to still be solid, and we have a slight overweight position in U.S. equities. Canadian economic growth could slow, as higher interest rates erode consumer spending and add to the slowdown in the housing market. We have a small underweight to Canada. With a slowing global economy, contentious Brexit negotiations and Italy’s troubled banking system overhanging European markets, we are underweight European stocks and neutral on EAFE equities overall. We are slightly overweight emerging markets, which may benefit as central banks become more accommodative and China stimulates its economy. We are slightly overweight the U.S. dollar and underweight the Canadian dollar. Our preference is for cash over bonds, given the small difference in yields. We are underweight high yield bonds due to higher risk. We expect bond yields in Canada and the U.S. to slowly rise in 2019. However, with uncertainty in the global economy and potentially higher market volatility, holding bonds in a portfolio is an important way to add stability in uncertain times. Overall, we expect a bumpier road ahead. We will be looking for ways to reduce risk and take advantage of investment opportunities. However, for now, we are comfortable with how the Sun Life Granite Managed Portfolios are currently positioned. This commentary contains information in summary form for your convenience, published by Sun Life Global Investments (Canada) Inc. Although this commentary has been prepared from sources believed to be reliable, Sun Life Global Investments (Canada) Inc. cannot guarantee its accuracy or completeness and is intended to provide you with general information and should not be construed as providing specific individual financial, investment, tax, or legal advice. The views expressed are those of the author and not necessarily the opinions of Sun Life Global Investments (Canada) Inc. Please note, any future or forward looking statements contained in this commentary are speculative in nature and cannot be relied upon. There is no guarantee that these events will occur or in the manner speculated. Please speak with your professional advisors before acting on any information contained in this commentary.